This month’s Session is a very Belgian one from Belgian Smaak who asks us to share our experiences with our first Belgian beer. In the free wheeling experimental and inclusive nature of Belgian beer, “the rules are that there are no rules”. So when writing about our first Belgian beer, we don’t have to write about our first one, or even a beer actually brewed in Belgium. That makes me highly tempted to write about the time my high school girlfriend scored a couple of stale cans of Strohs on a date, the was the first beer I ever drank. Well, the first beer I ever drank if you don’t count a few sips of Rolling Rock my dad periodically allowed me to try from his glass. However, it just doesn’t seem right to twist that beer experience into this Session. Instead, let me tell you about the first Belgian beer I remember drinking, Brother Thelonious from North Coast Brewing. It was on a trip through California’s Mendocino County over seven years ago where my wife and I stopped at North Coast’s brewpub across the street from their production brewery in Fort Bragg. I still remember my surprise at it’s intense banana fruitiness, calling it “banana beer”. I was just discovering all the possibilities of craft beer then, and this “banana beer” was a big part of that discovery. 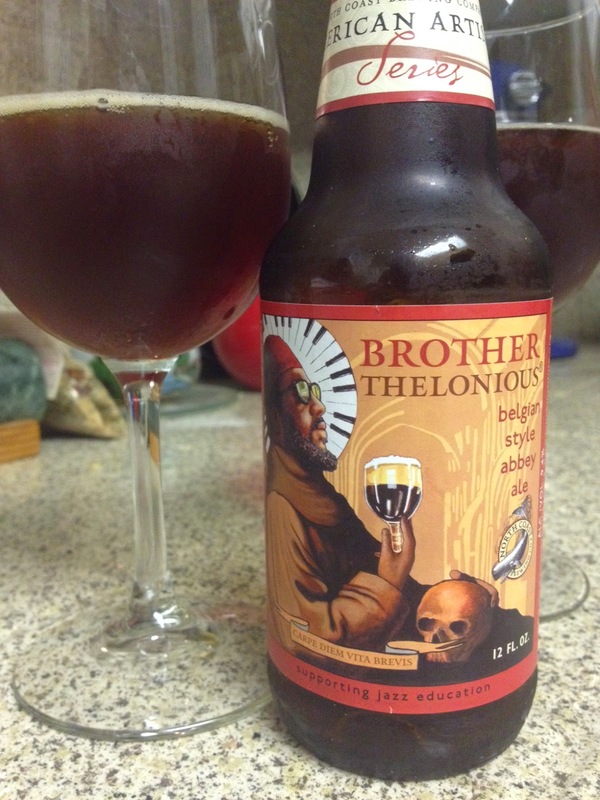 Revisiting a couple bottles of Brother Thelonious last week, I found it to be have plenty of fruitiness but more like prune than banana with some dark malt roastiness, and light aromatics one associates with Belgian ales. I’m not sure exactly what “banana” I was tasting with those first sips of Brother Thelonious back then with, but this beer remains a discovery. OK, since this beer is brewed in the United States, is really isn’t a “Belgian beer”, a non-issue for our Session host, but a distinction that’s gotten Stephen Beaumont into a lather. Which raises the question: How is it that only Belgium and no other country has transferred its nationality to any American beer inspired by its brewing traditions? An American brewed Hefeweizen is hardly considered a German beer. At least it’s no more German than an American brewed Bitter is British, or an American Pilsner is Czech. Does this Belgian nationality transfer phenomenon hold true in other countries besides the United States? I realize tedious hair-splitting is what gives beer writers something to write about, but is it too much to ask ourselves why this happened rather than go around slapping peoples wrists whenever they declare something “Belgian” even when it actually isn’t from Belgium? Well, the problem is, I really don’t know why or how the country of Belgium achieved this impressive feat of national identity transfer and nobody else seems to know either, so maybe we should go back to all the tedious hair-splitting. Except our Belgian Session host has no interest in splitting hairs, so maybe that should tell us something. Very well. My first Belgian beer I remember that was actually from Belgium was none other than Chimay Grande Reserve Blue paired with bread pudding at a beer and dessert pairing a couple years later after that trip to Mendocino County. Beer and dessert pairings seemed a little novel way back in 2009, and once again as I further discovered beer’s many possibilities, a Belgian beer was a big part of that.